Fly-Fishing for Fall Steelhead in Michigan is magical. Leaves are changing color and the grouse hunters are in the woods. When the salmon runs come to an end, they have completed their life cycle. 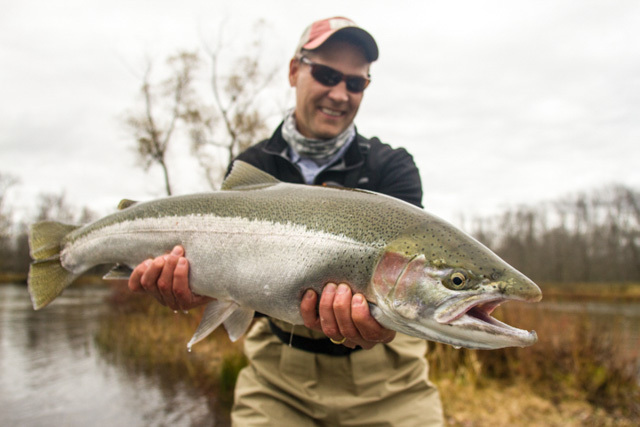 At this time Michigan anglers are gearing up to capture the most prized of all fly rod freshwater game fishes, the fall steelhead. All of the rivers on the west coast of Michigan get a fall steelhead run. Some years it is better in some rivers than others. The big three, Manistee River, Pere Marquette and Muskegon all get good runs of steelhead. Timing can vary year to year but generally they start showing in decent numbers towards the end of the Salmon run. We continue to fish them all winter and into spring when they complete their spawning cycle. sink tips is the preferred method. In addition to two hand rods, lines have been developed in the last few years providing single hand casters the same opportunities. Most of the Michigan steelhead taken swinging flies aren’t taken on the traditional west coast patterns but on flashier, articulated patterns in a wide range of colors.The key element to these flies is movement. Most of all you want flies that look alive. While swinging for steelhead rarely produces as many strikes as the methods discussed below, having a silver bullet come up from the bottom and smash your fly is almost heart stopping. Another method is to fish dead drifting flies using split shot and a strike indicator or float. Strike indicator nymphing is a very satisfying way to catch steelhead. Use the same method that you use to catch trout during the summer just use bigger equipment and heavier leaders and tippet. I like to use a switch rod for this technique so that I can set the hook farther away. The set up consists of a sliding float, a series of shot that decreases in diameter as you get closer to the fly, and a swivel. Finally an egg or nymph fly 18 inches off the swivel on 6-8 pound test fluorocarbon tippet. Cast into a likely seam, mend upstream and feed line out as the float carries the fly downstream. Float moves, set the hook!. Remember to adjust depth so that the fly is close to the bottom. 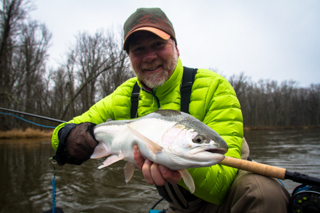 Learn more about the set-up , and fishing the Manistee River for Steelhead. In Michigan we use three different methods to catch fall steelhead using fly tackle. The least traditional, but sometimes necessary method is what we call chuck and duck or drift fishing. To a small diameter running line (company’s such as Rio and Orvis carry this type of line) the angler attaches a ten foot section of fifteen pound test line and ends it with a swivel. Above the swivel lead is added to the line via a snap swivel set up so that it slides up and down the fifteen-pound test. From the swivel add six or eight-pound test tied with a dropper. Tie on a couple of flies and you’re ready to fish. Lob the weight into a likely run and feel it touch the bottom. You want to lightly tick the bottom, not pound down the run. Most of all matching your weight to your run is critical. Everyone loves the hammering hits that fall steelhead provide. But once in a while a soft bite occurs. Imagine how light a steelhead can take a single egg or small nymph. Your weight needs to match the water depth and current speed, you don’t want to be too heavy or you won’t feel those soft bites. So what are the best places to look for fall steelhead? Due to the fact that Fall run steelhead love eggs the first place to look is behind spawning gravel. Therefore if you know where the Kings, Coho, and Lake-run Browns are spawning look for steelhead in behind these gravel areas. As the season progresses look for fish in the deeper runs in seams and near structure. Fly selection early will lean heavily towards egg patterns while the river is full of natural eggs. Consequently the bite will turn to nymphs as the season moves towards winter. Fall steelhead combine jewel like beauty, superb fighting skills and wariness not found in most other fish. Steelhead in the fall are difficult to hook, land and even photograph. Hence everyone captured should be remembered for the prize that it is and released to complete its life cycle. Please release all Steelhead!